The season premiere of Burgers, Brew & ‘Que on Friday, September 9th at 10pm. This season it seems like Michael Symon is meeting up with a celebrity each episode. The season premiere of Worst Cooks in America: Celebrity Edition on Wednesday, September 14th at 9pm. Here are the celebrities appearing on the show for season two. The Chopped Teen Tournament finale on Tuesday, September 20th at 10pm where the winner takes home $25,000. The finale of Camp Cutthroat 2: Alton’s Revenge on Wednesday, September 21st at 10pm where the winner could take home up to $75,000. The finale of Guy’s Superstar Grocery Games on Sunday, September 25th at 8pm where the winner could win up to $40,000 for their favorite charity. The finale of Food Network Star Kids on Monday, September 26th at 8pm where the winner will get a series on Foodnetwork.com. The series premiere of Star Plates on Tuesday, September 27th at 11pm. A Cutthroat Kitchen: Tournament of Terror tournament that begins on Wednesday, September 28th at 10pm and is a Halloween-inspired tournament. New primetime episodes of Beat Bobby Flay, Cake Wars, Chopped, Chopped Junior, Cooks vs. Cons, Diners, Drive-Ins and Dives, and The Great Food Truck Race. New daytime episodes of Guy’s Big Bite, Brunch @ Bobby’s, Giada in Italy, The Kitchen, The Pioneer Woman, Smollett Eats, Trisha’s Southern Kitchen and Valerie’s Home Cooking. NEW YORK – September signals the arrival of fall and with that sweaters, foliage and, of course, a new batch of exciting new series and returning favorites on Food Network. Grilling season may be wrapping up, but burgers never go out of style and Michael Symon is finding the best of the best on the season premiere of Burgers, Brew & ‘Que on Friday, September 9th at 10pm. Tune in as he uncovers the tastiest burgers, BBQ and beer the country has to offer. Then, the kids aren’t the only ones returning to the classroom. 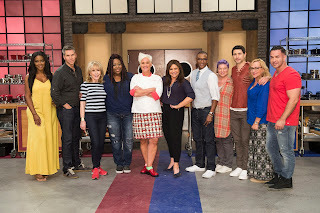 Mentors Anne Burrell and Rachael Ray have their hands full in the kitchen with the most challenged group of celebrity chefs yet on the season two premiere of Worst Cooks in America: Celebrity Edition premiering on Wednesday, September 14th at 9pm. Next up is the suspenseful close of Chopped Teen Tournament on Tuesday, September 20th at 10pm when four previously victorious teen chefs will re-enter the Chopped kitchen with host Ted Allen for the chance to win the grand prize of $25,000. Then, four talented chefs who survived Alton Brown’s most evilicious sabotages to date will return to camp to battle it out for the win and the chance to return home up to $75,000 richer on the tournament finale of Camp Cutthroat 2: Alton’s Revenge on Wednesday, September 21st at 10pm. On Sunday, September 25th at 8pm the final four superstar chefs take on three grueling rounds of Guy Fieri’s most epic games yet in the tournament finale of Guy’s Superstar Grocery Games, competing for the ultimate bragging rights and $40,000 for their favorite charity. Next up, don’t miss the finale of Food Network Star Kids on Monday, September 26th at 8pm when hosts Tia Mowry and Donal Skehan name the first ever winner! Next, the stars align in the series premiere of Star Plates on Tuesday, September 27th at 11pm when a group of A-listers team up with their favorite chefs to see if they have the chops to serve as their line cook for a busy night in their restaurants. Then, get a jumpstart on Halloween with host Alton Brown as he scares up a new batch of sabotages in the first-ever Cutthroat Kitchen: Tournament of Terror on Wednesday, September 28th at 10pm, a five-episode Halloween-inspired tournament involving more than just tricks-or-treats. Food Network is also serving up primetime premieres of Beat Bobby Flay, Cake Wars, Chopped, Chopped Junior, Cooks vs. Cons, Diners, Drive-Ins and Dives, and The Great Food Truck Race. In daytime, Guy Fieri is back in the kitchen dishing out the most righteous recipes he can cook up on a new season of Guy’s Big Bite. Also in daytime are premieres of Brunch @ Bobby’s, Giada in Italy, The Kitchen, The Pioneer Woman, Smollett Eats, Trisha’s Southern Kitchen and Valerie’s Home Cooking. FoodNetwork.com is the go-to guide for fall with seasonal recipes, entertaining tips, produce guides and back-to-school kid friendly specialties. Join the Food Network conversation on Facebook and Twitter. Cooking Channel’s Haylie Duff and Food Network’s Curtis Stone aim to knock their friend Bobby Flay down a couple of pegs, as Washington, D.C. veteran Todd Gray and Maryland’s French-trained Gabonese caterer Serge Pambo go mano-a-mano for a shot at the champ. Food truck owner Ed Hardy and Indian chef Kunal Lamba are here to prove there’s more than meets the eye. Bobby Flay’s friends, actress Debi Mazar and Chef Geoffrey Zakarian, are praying that one of these chefs can help break their own losing streaks. TV food stylist Jackie Rothong takes on Italian-born Matteo Boffo, each hoping to send the other one packing early. Food Network’s Scott Conant and reality star entrepreneur Bethenny Frankel must decide who actually gets a shot at Bobby Flay. Worst Cooks in America’s Anne Burrell and wisecracking comedian Mario Cantone want nothing more than for Bobby Flay to crash and burn! Martin Rios from Santa Fe, New Mexico and proud Jersey boy Geoff Johnson are hoping they have an edge over each other and Bobby. Online, find out what it takes to beat Bobby when Food Network chefs reveal the skills and tactics needed to defeat him. Check out behind-the-scenes photos and videos, relive highlights, tour the set and much more. Join the conversation with #BeatBobbyFlay. Burgers, Brew & ‘Que – Premieres Friday, September 9th at 10pm – SEASON PREMIERE! Meat lovers rejoice! Michael Symon is taking a summer road trip to taste the best of the American classics: burgers and barbecue. Whether it’s mouthwatering, mile-high cheeseburgers or slow smoked, fall-off-the-bone ribs, Michael is going to eat and meet his way through some of the best All-American spots to get your grub on. And, what better way to wash it all down than with local beers and brews, sure to make any meal a perfect 10. So, get ready to get full, because you don’t want to miss the delicious flavors of Burgers, Brew & ‘Que. With a day off from his concert tour, musician Nick Lachey hooks up with Michael Symon in Philadelphia, one of the best beer cities in the country with a food scene to match. From Chef Jose Garces’ over-the-top bourbon burger, to true German smoked sausages, to authentic Italian pizza, everything they eat pairs perfectly with Philly’s endless array of local and European brews. Michael Symon is in the Traverse City area of Northern Michigan with Mario Batali, a longtime summer resident who takes Michael on a tour of his treasured local spots. They enjoy heavenly smoked fish straight from Lake Michigan, delicious brews at his favorite up-and-coming watering hole and the region’s famous olive burgers where they end the night rocking out to one of Mario’s favorite bands. For Anthony Anderson, Chicago represents great childhood memories and outrageous adult shenanigans. He hooks up with his old pal, Michael Symon, to discover some of the city’s legendary food institutions for sensational smoked sausages and indulgent burgers, and to discover some of its best new treasures for phenomenal pork and rare brews. Along the way, he helps settle a dispute Michael has with a local chef by referring a wild and hilarious sumo-style wrestling match. Online, viewers can flip through photos and restaurant listings to find out more about Michael’s favorite destinations. Plus, his adventures continue online in a new video series where Michael makes one last stop at can’t-miss spots in each town. Join the conversation with #BurgersBrewQue. The one and only Garfield brings his birthday smile and big appetite to Cake Wars! Four incredible cake artists compete to have their creations at the center of a party celebrating everyone’s favorite lasagna-obsessed cat, as well as take home $10,000. Gregg Berger, the voice of Odie on The Garfield Show, steps in as guest judge to help host Jonathan Bennett and judges Florian Bellanger and Waylynn Lucas. Blossom, Bubbles and Buttercup fly into Cake Wars to celebrate the iconic animated series The Powerpuff Girls! Four bakers will need their own superpowers as they compete to have their amazing cake creation at the center of the party and take home the $10,000 prize. Amanda Leighton, Kristen Li and Natalie Palamides, the voice actresses behind The Powerpuff Girls, serve as guest judges with host Jonathan Bennett and judges Ron Ben-Israel and Waylynn Lucas. It’s the 75th anniversary of Wonder Woman and Cake Wars is joining the party! Four bakers will face the golden Lasso of Truth from our judges, but only one cake will be chosen as the centerpiece of a party celebrating the iconic hero’s birthday and take home $10,000. Nicola Scott, Wonder Woman comic book artist, joins the judging panel with host Jonathan Bennett and judges Ron Ben-Israel and Waylynn Lucas. Beloved icons James and the Giant Peach, Charlie and the Chocolate Factory and the BFG come to the Cake Wars kitchen to celebrate the 100th birthday of world-famous children’s author Roald Dahl. Four bakers will have to put their imaginations into overdrive as they compete to have their cake at the center of this centennial birthday party and take home $10,000. Chloe Dahl, Roald Dahl’s granddaughter, steps in as special guest judge to help judges Ron Ben-Israel and Waylynn Lucas. Online, check out the images and recipes of the winning cake artists’ magical creations, hilarious behind-the-scenes videos of Jonathan and the judges on set and more. Plus, weigh in on your favorites on Twitter using #CakeWars. In the third heat of Camp Cutthroat 2: Alton’s Revenge, two chefs have to make waffle breakfasts with their arms stuck in rocks. Then, one chef has to have Bob the Bear cook their grilled fish dish for them. Finally, one chef has to prep their crumble in quicksand. In the fourth heat of Camp Cutthroat 2: Alton’s Revenge, two chefs have to make a breakfast burrito while hanging a net. Then, one chef has to light a hiking snack on fire to cook their burger. Finally, one chef has to be pulled behind a jet ski to get new ingredients for their trail mix dessert. Premiering Wednesday, September 21st at 10pm – “Finale, The Great Out S’mores” – TOURNAMENT FINALE! In the finale of Camp Cutthroat 2: Alton’s Revenge, two chefs must make their chili dogs in a leaky boat. Then, two chefs have to make their game dishes while helping each other balance on a log, and finally, two chefs have to go to war to make their s’mores desserts. Also, experience more of Alton’s diabolical sabotage series Camp Cutthroat 2: Alton’s Revenge with behind-the-scenes footage, video and photo highlights, exclusive interviews with Alton, tips for your own camp-inspired cuisine and cutthroat cocktail recipes. Join the conversation with #CampCutthroat. A serious time management issue in the first round featuring naan and blood sausages gets one of the competitors in trouble as the last seconds tick away. A very expensive fish in the entrée basket has the judges hoping that the chefs know how to treat it right. Then, the finalists come up with some creative desserts as they tackle a fruit-filled third basket. A basket ingredient with a “secret” history and the fermented milk drink kefir are at the forefront of the appetizer round. The second basket looks to be deceptively simple, except for a strange blue drink. Then, something you wouldn’t expect to find in a can is discovered in the dessert basket, and the last two chefs decide to go in a similar direction with their final plates. Online, check out photo and video highlights and compete like a Chopped champion for a chance to win prizes. Get culinary inspiration from the Chopped experts and learn the tricks contestants have successfully deployed to transform exotic ingredients, international spices and even wintry leftovers into winning dishes. Join the action with #Chopped. Talented 11- and 12-year olds are ready to prove their culinary expertise to the judges. First, they set out to make pleasant pheasant dishes in the appetizer round, then the entrée basket features something gummy and some yummy ducks. For dessert, one of the competitors must quickly come up with a back-up plan when a key element doesn’t turn out right. A new group of ambitious junior chefs must win over a special panel of judges. First up, an odd egg and a unique version of chicken and waffles are found in the basket. Orange noodles and a red paste are among the colorful ingredients that the young chefs must promptly address in the entrée round, and the two finalists must find creative ways to turn Italian pudding and sweet sushi-shaped sandwiches into original desserts. The young competitors get a generous 30 minutes to cook minute steak in the appetizer round. Breaking down a bird is part of the challenge in round two, along with figuring out what to do with some cool ketchup. Then, the dessert basket contains some delicious stuffed fruit and a fun snack cake. Savory meets sweet, and all is awesome! The junior chefs find something called an “everything donut” in the appetizer basket, which they must make work with a pickled pork product. Cooking venison is a new experience for some of the junior chefs in the entrée round, then a competitor makes a bold move in the final seconds of the dessert round. Online, super fans can find a huge treat with entertaining behind-the-scenes footage of the talented kid chefs and all their antics in between takes. Additionally, hear from the amazing panel of judges in interviews captured on set and upgrade your brown-bag lunch with ideas captured from the competition. Join the conversation on Twitter using #ChoppedJunior. In the third of four preliminary competitions, a new group of teen chefs arrives in the Chopped Kitchen with tons of energy, which they put to good use cooking short rib appetizers. An already-cooked, artificially-colored ingredient appears to be the most puzzling ingredient in the entrée basket, and in the dessert round, a pastry bag of pate a choux leaves the competitors wondering what to do. Four more teen chefs battle it out for the last spot in the $25,000 finale. A can of something strange and a bottle of something sour are two of the ingredients that the competitors must use in the appetizer round. The fryer sees some action in the entrée round when one teen chef decides to deep-fry the basket’s protein. Then, the two finalists must figure out how to repurpose a cake they find in the dessert basket. Premiering Tuesday, September 20th at 10pm – “Teen Tournament: Finale Night” – TOURNAMENT FINALE! Four teen winners have returned to compete in the grand finale of the tournament with $25,000 at stake. The young cooks find a surf-and-turf combination in the appetizer basket and aim to distinguish themselves from their opponents with their first plates. Butchering skills come into play in the entrée round, then one teen chef’s premonition about a mango in the dessert basket comes true! Online, fans can dive into more content around the teen sensations tackling the mystery baskets. Meet the competitors, get behind the scenes photos, check out photo and video highlights and even see an exclusive interview with the winner. Join the action with #Chopped. A hearty challenge is set for the pros and amateurs when chowder must be prepared with carnival treats. The waft of the fairgrounds intoxicates some, but one cook falls into a deep-fried funk! Then, will the judges undress the cons in the second round as they try to use the surprise ingredient of salad dressing? Professional cooks and amateurs play ball in a cheesesteak playoff, as ballpark snacks must be worked into a winning dish. The judges call a fair game, but for one cook, it’s a clear strikeout! Then, the remaining contestants embrace the Italian kitchen during a pasta sauce challenge. The judges try to avoid a carb overload as the cooks deconstruct pizza to accent their Parmesan-inspired dishes. Then, the pros try to separate themselves from the home cooks as they create masterpieces from deli food. The British staple of fish and chips makes its way across the pond as the cooks fry up their interpretations for judges. Later, the competition gets reheated as Thanksgiving leftovers are used to create a winning dish. Online, after incognito home cooks battle undercover culinary pros, fans can catch highlights and quizzes to find out if you could pose as a pro chef. Join the conversation with #CooksVsCons. Cutthroat Kitchen: Tournament of Terror – Premiering Wednesday, September 28th at 10pm – TOURNAMENT PREMIERE! Cutthroat Kitchen celebrates Halloween as sixteen terrified chefs return to cook their way through all of the horrors that Alton Brown has in store. This Tournament of Terror features four heats and a finale of scares, screams and crazy costumes. The chefs brave witches, mummies, ghosts and zombies; cook with deadly weapons, on tombstones, in closed coffins all while avoiding Alton’s wrath, as they seek to come out on top in the Tournament of Terror. In heat one of the Halloween Tournament of Terror, three chefs have to make their deviled eggs while dressed as scary monsters. Then, two chefs have to make their spider rolls on a giant spider web. Finally, one chef has to make their flambé dessert in a haunted, spinning kitchen. This trip, Guy Fieri is taking an eclectic, global-infused tour of Flavortown. In Minneapolis, Minnesota, he stops at a neighborhood Italian spot carrying on a fun, family pizza-making tradition. In Miami, Florida, he visits with a champion chef cooking Haitian classics like griot, snapper and octopus. And in Portsmouth, New Hampshire, there is a funky joint putting their own spin on street food from around the world. This trip, Guy Fieri is grabbing all kinds of cosmopolitan comfort food. In Portsmouth, New Hampshire, there is a righteous joint putting a New England spin on corned beef and cabbage, plus a fresh take on stroganoff. In Los Angeles, California, Guy meets a mother-daughter team dishing out authentic Ethiopian specialties. And in Minneapolis, Minnesota, there’s an over-the-top hot dog spot loading up with beef, sausage, and even lamb poutine. This trip, Guy Fieri is all about the best of the west. From a taste of the Rocky Mountains to southwestern specialties, he’s takin’ in the flavor of the region at all kinds of righteous joints. In a test of communication skills, the six junior finalists must work in teams of two to prepare a tasty two-item Sunday dinner, then livestream a tip about their meal. Mentors Tia Mowry and Donal Skehan, along with special guest mentor and online video personality, Gabriel Conte, will determine which team had the most successful livestream. At the end of the day, one junior finalist is eliminated. It’s all about confidence for the five junior finalists when they must sell an audience on an unusual ingredient. Then, the kids must use a different odd ingredient in a dish and present it to mentors Tia Mowry and Donal Skehan. One junior finalist’s dish will not make the cut and be sent home. The focus is on charisma as the four remaining junior finalists must pitch two of their favorite lunch dishes to mentors Tia Mowry and Donal Skehan, along with some special guests, comedian Loni Love and actor Neel Sethi, breakout star of The Jungle Book. With a few notes and adjustments from the panel, one dish is greenlit, while another competitor is sent home. Premiering Monday, September 26th at 8pm – “The Most Important Meal of My Life” – SEASON FINALE! The three remaining junior finalists shoot sizzle reels to whet the appetites of mentors Tia Mowry and Donal Skehan as they shop for ingredients to prepare “the most important meals of their lives.” Back in the kitchen, the kids must prepare and present their final dishes, while their sizzle reels are played back to the mentors, to determine who will be named the first ever Food Network Star Kid and host their own series on FoodNetwork.com! Online, get to know the kid competitors, relive the top moments of each episode and watch the champion host his or her own web series. Also, check out fun photos and facts about the kids, photo and video highlights, exclusive interviews with hosts and judges, and of course recipes for kids! Join the conversation with #StarKids. The five remaining teams head up the Pacific Coast Highway to Ventura County with host Tyler Florence, where they are the main attraction at the California Strawberry Festival. The teams must create a one sweet and one savory dish featuring the locally-grown strawberries. A team uses their family network to attract customers, tensions develop from another team’s disorganization, rivalries form between the trucks while jockeying for selling turf and a team is eliminated. Four teams head inland to Santa Barbara Wine Country with host Tyler Florence where they face an ostrich egg hunt. The trucks then must sell in the Danish village of Solvang, where the challenge is steeped in local culture. After some setbacks and a busy weekend, one team is sent home after a very close elimination. Three trucks brave the sweltering desert heat of Palm Springs with host Tyler Florence for a sweet challenge. The next day, they must become “human roadside attractions” and create costumes to draw customers to their trucks. Tempers flare as temperatures rise, and another team goes home leaving the two teams heading to the finale. Premiering Sunday, September 25th at 9pm – “The Island” – SEASON FINALE! The two final teams head back to Los Angeles with host Tyler Florence to catch a ferry to Catalina Island, but first they must compete as hot dog vendors in the port town of San Pedro for a travel advantage to get to the island. On the island, the families sell side-by-side and put everything on the line to win the $50,000 grand prize and be named winner of The Great Food Truck Race: Family Face Off. Online, head deeper into the race and challenges, packed with videos, photos, behind-the-scenes footage and featured restaurants along the race’s route. Join the conversation with #GreatFoodTruckRace. The biggest tournament in Triple-G history continues, and in the first round, the seven remaining celebrity chefs make a fine dining dinner using ingredients chosen by the dreaded Food Pyramid. Then, the bottom three superstars must fight for their survival in a diabolical round two, with one chef checking out of Flavortown. Guy’s Superstar Grocery Games continue as the remaining six celebrity chefs are paired up into teams to navigate through Guy Fieri’s most terrifying game yet. In round two, the chefs must switch gears and go from savory to sweet as they make their best dessert. The five remaining celebrity chefs go into their fourth intense week of competition. In the first round, they must make a gourmet entree using Guy’s son’s favorite snack foods. The winning chef automatically earns a spot in the finale, while the bottom four battle it out for the remaining slots. Premiering Sunday, September 25th at 8pm – “Guy’s Superstar Grocery Games: Finale” – TOURNAMENT FINALE! The final four culinary superstars face three rounds of Guy Fieri’s most epic games yet, as decided by the never-before-seen Wheel of Games. After each round, a chef is eliminated until one superstar remains. The victorious chef is crowned the first-ever Superstar champion and wins $40,000 for their charity of choice. Online, fans can relive the top moments of the tournament, test their supermarket trivia smarts, collect shopping and cooking tips from the judges, and much more. Join the conversation on Twitter using #GroceryGames. Star Plates – Premiering Tuesday, September 27th at 11pm – SERIES PREMIERE! In each episode a celebrity guest experiences life as line cook, working side-by-side with the chef at a restaurant they love, learning to cook their favorite dish on the menu. In a one-night crash course, the celebrity makes a culinary dream come true. Worst Cooks in America: Celebrity Edition- Premiering Wednesday, September 14th at 9pm – SEASON PREMIERE! Anne Burrell and Rachael Ray lead teams of celebrity recruits through a rigorous culinary boot camp as they try to teach them kitchen skills. They only have eight weeks to turn these kitchen disasters into kitchen masters, but in the end, one celebrity will earn $50,000 for the charity of their choice. The new cast of celebrity recruits quickly learn that boot camp is no walk down the red carpet! To assess everyone’s skill, Anne Burrell and Rachael Ray have the celebrities cook a dish using some unique ingredients from their swag gift bags. Then, they teach them a simple steak and eggs dish, which proves to be much harder than expected for the clueless cooks. After Anne and Rachael pick teams, one celebrity is sent back to Tinseltown. In the spirit of Oktoberfest, Anne Burrell and Rachael Ray have their teams cook a traditional wiener schnitzel involving a relay-race! Afterwards, the celebrities learn Oktoberfest-inspired meals, which includes making sausages from scratch. The two least successful recruits go head-to-head in a sausage challenge, and one recruit is sent packing. Online, find more content from this epic culinary boot camp, see photo highlights and catch behind-the-scenes moments. Watch videos and hear from mentors Anne and Rachael and the kitchen-challenged celebs. Join the conversation with #WorstCooks. Bobby Flay grabs a meal from his favorite New York City barbecue joint, Mighty Quinn’s, then makes a delicious brunch with all the leftovers. He whips up some BBQ Pulled Pork Corn Chip Pie, a Texas Toast Brisket Cheesy Egg Sandwich and Smoky Home Fries with Burnt Ends, then sweetens things up with a Spiked Banana Cream Pie Milkshake. Bobby Flay creates three breakfast sandwiches inspired by some of his favorite things. He opens up with the Sabich, an Israeli pita sandwich inspired by his favorite falafel shop, then creates an Egg-in-a-Hole Benedict with Roasted Tomato-Garlic Hollandaise that pays homage to his daughter. He finishes up with a Crunchified Chilaquiles Burger and the Tipsy Palmer, a cocktail based on the Arnold Palmer. Bobby Flay is coming out with his very own Bobby Flay Fit Book! He’s sharing a few of his favorite quick, light and healthy brunch recipes that don’t lose on flavor. Starting off the day right is a Spicy Turkey Merguez Scramble, Roasted Chickpeas and Avocado, followed by a tasty take on Peanut Butter and Jelly Cream of Wheat. To finish off the meal is a hydrating Orangeade complemented by a lean Kale Salad with Ham and Cheese Mini Quiche Croutons. Bobby Flay breathes new life into classic biscuits by showing what else you can do with leftover biscuit dough, day-old biscuits and scratch-made Buttermilk Biscuits. This biscuit bonanza includes Biscuit French Toast with Cinnamon Orange Cane Syrup, Chilled Bourbon Vanilla Latte, Ham, Tomato and Cheddar Sandwiches and, to button it up, a Doughnut with Lemon Cream Filling and Blueberry Sauce. Online, find Bobby’s brunch recipes and build a better brunch, Bobby Flay Style. Giada De Laurentiis spends the day taking a boat trip along Florence’s Arno River and enjoying a traditional Italian spread with her daughter, sister and nephew. The picnic menu includes Kale Salsa Verde Bruschetta, Tuna, White Bean and Bitter Greens Salad and Torrone Mess for a light dessert. Online, see photos from the show and try the recipes that celebrate Giada’s Italian heritage. Join the conversation on Twitter using #GiadaInItaly. Premiering Sunday, September 11th at 9:30am – “Guy’s New Favorite Burger” – SEASON PREMIERE! Guy Fieri has tasted burgers from coast to coast, and now he’s sharing one of his all-time favorites. It’s the juicy, cheesy Pimento Cheese Stuffed Burger stacked high with a fried heirloom tomato, Homemade Spicy Ranch Dressing, crispy bacon and cabbage slaw. Spicy Baked Shredded Potato Nuggets seasoned with homemade barbecue seasoning finish off the plate. So money! Guy Fieri is in the kitchen with football pro Marcel Reece, cooking up an all-star meal for big appetites with little time to spare. We’re talking Mojo Mahi Mahi, marinated in fresh citrus and herbs, grilled, and served over a Toasted Quinoa Pilaf with Tomato Mango Cucumber Relish. A Grilled Red Cabbage Salad with White Miso Dressing is served on the side. Guy Fieri and his buddy Rev Run cook up a meatless meal inspired by their veggie-loving siblings. The main event is a hearty Roasted Cauliflower Burrito filled with potatoes, chickpeas and Guy’s Spicy Refried Beans and topped with Spicy Peach Chutney. Online, turn up your meals with Guy’s biggest and boldest dishes. Find his recipes, watch highlights from the show and get to know more about Guy. And join the conversation on Twitter using #BigBite. Online, access all of the co-hosts’ cooking short-cuts, recipes and tips. Whether you need menu inspiration for an upcoming party or want to remake the ingredients already stowed in your pantry, FoodNetwork.com has you covered. Also, bookmark new recipes and advice, browse behind-the-scenes photos, take audience polls and much more. Join the conversation in #TheKitchen. Ree Drummond’s family is throwing a joint birthday bash for Todd and his cousin Caleb, so she’s cooking up Caleb’s barbecue favorite, Spicy Pulled Pork Sliders piled high with fabulous fixin’s, along with make-ahead Slow Cooker Baked Beans. Then, per Todd’s request, a towering, three-layered homemade Confetti Cake for the boys to share! It is dinner for two with Ree Drummond and her husband, Ladd, who is stacking hay then turning into cowboy cook in the kitchen! They whip up quick and easy jumbo Fried Shrimp with a simple cocktail sauce, then golden, spicy Curly Fries and a speedy Grilled Corn Casserole. For dessert, it’s Mexican Chocolate Sundaes with Cinnamon Hot Fudge Sauce. Online, find all of Ree’s recipes, watch exclusive video tours of the Drummond ranch and town, peek inside her kitchen and watch full episodes. Join the conversation with #PioneerWoman. Jake Smollett has always dreamed of testing his skills in the world of street food and gets his chance when he takes over a friend’s food truck and brags about his killer Steak Banh Mi Tacos on social media. Sisters Jurnee Smollett-Bell and Jazz Smollett see his video and decide to crash the action by showing up in their own truck, with Southern-inspired Oyster Po’ Boy Sliders on board, to challenge Jake and brother Jojo Smollett to a truck vs. truck throw down. The loser has to post a video of shame online! It’s all hands on deck when the Smolletts throw their epic annual barbecue under the stars. There’s a trip to the butcher for Jake Smollett’s Apricot-Mustard Glazed Baby Back Ribs, Jussie Smollett makes his famous Teriyaki Chicken Wings with Pineapple and Ginger Glaze, while Jurnee Smollett-Bell plans to wow with her gooey Stovetop Mac n’ Cheese. Plus, Jazz Smollett worries that her Bourbon-Soaked Grilled Peach Dessert with Lemon Mascarpone Cream will be pushed aside, and Jojo and Jocqui Smollett struggle to get Jake’s new grill assembled in time for the party. To celebrate their mom’s Southern roots, the Smollett kids plan a meal based on her New Orleans upbringing. After a visit to the local seafood market to pick out crawfish and shrimp for a Seafood Boil, Jake Smollett assumes Jurnee Smollett-Bell and Jazz Smollett will help him with the grunt work, but his sisters are nowhere to be seen. As a reward for deveining all the shrimp, Jake helps himself to some of Jurnee’s Corn Bread. When Jazz returns to cook up her Fried Okra, Jurnee is still missing in action, distracted by food plans of her own. Jazz and Jake are left wondering if their sister will be a no-show at the main event. Premiering Saturday, September 17th at 12:30pm – “Jocqui Shows His Chops” – SEASON FINALE! Baby brother Jocqui Smollett is eager to prove that his cooking skills are worthy of the Smollett family’s culinary ranking system, so he plans to wow his siblings with a Mexican menu. Jocqui visits L.A. restaurant Chichen Itza where he learns how to make homemade tortillas and a killer horchata-based cocktail. Back at the house, Jocqui hopes that his Pork Lager Chili Verde and Homemade Tortillas and Chips will win over foodies Jazz and Jake Smollett. Online, find all the recipes featured on the show, get to know more about the Smollett family and see all the top moments. Join the conversation on Twitter using #SmollettEats. Grilling ain’t just a guy thing! Trisha Yearwood invites her girlfriends, Jenn and Sara, for a day of barbecue, cocktails and games. She’ll whip up some Potato Salad, grill up her cousin Fred’s Barbecue Pork Ribs, mix together a Cherry Moscow Mule and bake a Butterscotch Pie. Trisha Yearwood takes advantage of a rare day off by cooking up her weekend favorites and hanging out with her dog, Emmy. Her recipes include Praline Cheesecake Bars, Jambalaya and Rice, a Ginger Grapefruit Fizz and an irresistible, chocolate-covered snack called Pandora’s Box. Online, find all Trisha’s southern-style recipes, watch highlights from the show, tour her Nashville kitchen and go behind the scenes. Join the conversation on Twitter using #SouthernKitchen. With summer ending and shorter days ahead, Valerie Bertinelli throws one last backyard soiree with her friends and family – husband Tom, chef Stuart O’Keeffe, actress Mackenzie Phillips, and Larry and Angela Robinson. She prepares an all-grilled menu: Salmon Burgers, Avocado and Grilled Corn Salad with Goddess Dressing, Grilled Sweet Potato Wedges and even a Grilled Pound Cake with Grilled Peaches, served with a Cinnamon Simple Syrup. Valerie Bertinelli and her husband, Tom, are inviting their best friends over for movie night! Valerie’s quick and easy menu, perfect for a backyard viewing party under the stars, includes Crab Boil Sliders, S’mores Popcorn, Lemon Dijon Potato Salad and a homemade Limeade and Mint Soda. Valerie Bertinelli’s dear friend injured himself snowboarding, so she brings him the perfect scratch-made supper he can enjoy at home. The travel-ready care package includes Marinated Olives, Manicotti with Italian Sausage, Tuscan Kale Salad with Anchovy Dressing, and an old favorite with a new taste, Strawberry Love Cake. Online, discover Valerie’s family-inspired recipes, go behind the scenes and learn more about the host’s cooking influences, family and even rescue dog in photo and video exclusives. Join the conversation with #HomeCooking. Celebrate the end of the season with picnic-friendly sandwiches, salads and more party recipes perfect for the end of summer celebration! Everyone knows a home cook’s toughest critics are the kids. FoodNetwork.com is going back to basics with back to school fare that’s simple, wholesome and 100% kid-approved! Food Network’s top talent share healthy, hearty meals to make the morning fuel-up fun, like open faced banana cinnamon toasts, egg in a hole, and spiced apple cider muffins. For the lunch bunch, we’ve got simple sandwiches and safe lunch-packing tips, and these new-school takes on classic cookie flavors. Also, don’t miss out on 5 Ways to Take Boxed Mac and Cheese to the Next Level! Get dinner on the table fast with FoodNetwork.com’s top fall recipes ready in under an hour! Entertain with ease this season with chefs’ best dinner-party recipes using comforting fall ingredients. Apples, butternut and acorn squash, pears, carrots and cauliflower are in season; rely on our guide to find the best recipes and tips for using up in-season produce.